Moore, L. C. & Park, S. H.* (2014). “Something for linguists”: On-the-fly grammar instruction in a Dutch as foreign language classroom. L2 Journal, 6(1), 1-20. Moore, L. C. (2012). Muslim children’s other school. Childhood Education, 88(5), 298-303. Moore, L. C. & Joseph, L. (2011). The OSU K12 Teacher Somali Workshop Project. Bildhaan: An International Journal of Somali Studies, 11, 135-149. Moore, L. C. (2011). Moving across languages, literacies, and schooling traditions. Language Arts, 89(2), 288-297. This article is part of a special issue ‘Remaking Literacies across Time and Place’. Click here for contents of the issue. Moore, L. C. (2009). On communicative competence…in the field. Language & Communication, 29(3), 244-253. This article is part of a special issue ‘Reflecting on language and culture fieldwork in the early 21st century’, edited by Suzanne Wertheim & Jocelyn Ahlers. See the table of contents of the issue. Moore, L. C. (2008). 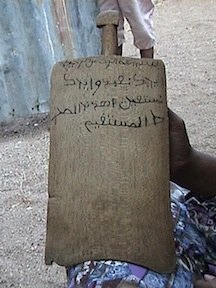 Body, text, and talk in Maroua Fulbe Qur’anic schooling. Text & Talk, 28(5), 643-665. This article is part of a special issue ‘The spirit of reading: practices of reading sacred texts’, edited by Laura Sterponi. See the table of contents of the issue. Qian Du, a doctoral student in FSLED, made a slideshow on this article. Moore, L. C. (2006). Learning by heart in public and Qur’anic schools in Maroua, Cameroon. Social Analysis: The International Journal of Cultural and Social Practice, 50(3), 109-126. This article is part of a thematic issue ‘The cultural politics of education and religion’, edited by Amy Stambach. Click here for contents of the issue. Moore, L. C. (2006). Changes in folktale socialization in a Fulbe community. Studies in African Linguistics, Supplement 11, 176-187, West African linguistics: descriptive, comparative, and historical studies in honor of Russell G. Schuh, edited by Paul Newman & Larry Hyman. Moore, L. C. (1999). Secondary language socialisation in a multilingual context: incongruence between community and classroom practice. Acquisition et Interaction en Langues Etrangeres, 1,numero special, 143-153. Moore, L. C., Seilstad, B. *, Ridley, J. *, & Kim, S.*. (forthcoming). Engaged second language research: Studying stakeholders’ perspectives on preschool dual language learners’ science and language learning. In K. Childress, N. King, EJ Park, H. Wilson (Eds. ), Selected Proceedings of the 2017 Second Language Research Forum (SLRF). Sommerville, MA: Cascadilla Press. Sayer, P., Malabarba, T., & Moore, L. C. (2019). Teaching English in marginalized contexts: Constructing relevance in an EFL classroom in Rural Southern Mexico. In H. t. Nguyen & T. Malabarba (Eds), Conversation Analytic Perspectives on English Language Learning, Teaching and Testing in Global Contexts. Bristol, UK: Multilingual Matters. Moore, L. C. (2017). Multilingual socialization and education in non-Western settings. In P. Duff & May, S. (Eds. ), Encyclopedia of language and education (3rd ed. ), Vol. 8: Language socialization, pp. 155-169. New York: Springer. Zurer Pearson, B., Lidz, J., McKee, C., McCullough, E. C., Moore, L. C., Phillips, C., Speer, S. R., Wagner, L., Zimmer, E. (2015). Linguistics for Everyone: Engaging a broader public for the scientific study of language acquisition. BUCLD 39: Proceedings of the 39th Annual Boston University Conference on Language Development, pp. 437-443. Sommerville, MA: Cascadilla Press. Moore, L. C. & Smith, M. M.* (2015). Chapter 15: Science education for young emergent bilinguals. In K. Cabe Trundle & M. Sackes (Eds), Research in Early Childhood Science Education, pp. 325-351. New York: Springer. Rogoff, B., Moore, L. C., Correa-Chavez, M., & Dexter, A. L.. (2014). Children develop cultural repertoires through participation in everyday routines and practices. In J. Grusec & P. Hastings (Eds. ), Handbook of Socialization, 2nd Edition, Theory and Research, pp. 472-498. New York: Guilford Press. Moore, L. C. (2012). Language socialization and repetition. In A. Duranti, E. Ochs, & B. Schieffelin (Eds), The Handbook of Language Socialization, pp. 209-226. Malden, MA: Blackwell. Moore, L. C. (2010). Language socialization and second/foreign language and multilingual education in non-Western settings. In P. Duff & N. Hornberger (Eds. ),Language Socialization (pp. 175-185). New York: Springer Reference. This is a stand-alone paperback version of volume 8 of the Encyclopedia of Language and Education. Rogoff, B., Moore, L. C., Najafi, B., Dexter, A., Correa-Chavez, M., & Solis, J. (2007). Children’s development of cultural repertoires through participation in everyday routines and practices. In J. Grusec & P. Hastings (Eds. ), Handbook of Socialization (pp. 490-515). New York: Guilford Press. Read reviews of the volume. Rogoff, B., Moore, L. C., Najafi, B., Dexter, A., Correa-Chavez, M., & Solis, J. (2007) Developpement des repertoires culturels et participation des enfants aux pratiques quotidiennes. In G. Brougere & M. Vandenbroeck (Eds), Repenser l’Education des jeunes enfants (pp. 103-138). Bruxelles: Peter Lang. Moritz, M., & Moore, L. C. (2006). Mini conference with poster presentations. In P. Rice & D. McCurdy (Eds. ), Teaching Strategies in Anthropology (4th edition) (pp. 1-3). Upper Saddle River (NJ): Prentice Hall. Moore, L. C. (2004). Multilingualism and second language acquisition in the Mandara Mountains. In G. Echu & S. Gyasi Obeng (Eds. ), Africa meets Europe: language contact in West Africa (pp. 131-148). New York: Nova Science. Moore, L. C. (2002). Language mixing at home and school in a multilingual community (Mandara Mountains, Cameroon). In J. E. Alatis, H. E. Hamilton & A.-H. Tan (Eds. ), Linguistics, Language, and the Professions: Education, Journalism, Law, Medicine, and Technology. Proceedings of the Georgetown University Round Table 2000 (pp. 135-140). Georgetown: Georgetown University Press. Read a review of the volume. 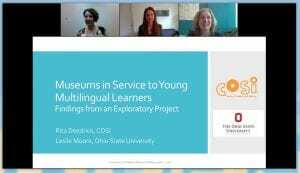 Museums in Service to Young Multilingual Learners: Findings from an Exploratory Project. with Rita Deedrick (COSI). Webinar for the Association of Children’s Museums (April 2019). 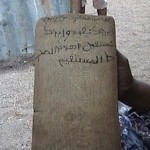 Somali History, Language, and Culture: A Workshop. with Laura Joseph. Ohio State University Foreign Language Publications (2013). Somali Studies for Educators. with Laura Joseph. Online resource for educators and other professionals who work with Somali children, youth, and families. Language learning in a multilingual country (August 2015). In Psychology Today, interview conducted by Aneta Pavlenko. Interview about multilingualism in the Mandara Mountains, conducted by Michael Erard for his popular science book Babel No More: The Search for the World’s Most Extraordinary Language Learners (2012, pp 190 and 206). Moore, L. C., Wagner, L., Speer, S. R., McCullough, E. A., Ito, K., Clopper, C. G., Campbell-Kibler, K. (2016). Outreach and engagement in a science museum. Anthropology News. Johanson, M.*, Wagner, L., Campbell-Kibler, K., & Moore, L. C. (2015). Evaluation of a training in science education outreach course summary. Center for Advancement of Informal Science Education (CAISE) Report 2015-05-06. Moore, L. C. (2006). Review of Language socialization in bilingual and multilingual communities. The International Journal of Bilingual Education and Bilingualism, 9(1), 150-152. Moore, L. C. (2004). Learning languages by heart: second language socialization in a Fulbe community (Maroua, Cameroon). Unpublished doctoral thesis, UCLA, 502 pages. Moore, L. C. (2003). Review of Sense Pass King: a story from Cameroon. H-AfrTeach, H-Net Reviews. April, 2003. Moore, L. C. (1999). Second language socialisation. The Clarion, Magazine of the European Second Language Association, 5(1), 43-44. Moore, L. C. (1998). Review of Themes for today: a beginning reading skills text. TESOL Journal, 7(3), 4-6. Moore, L. C. (1997). Toward an ethnography of second language learning motivation in a multilingual context (Mandara Mountains, Cameroon). Unpublished Masters thesis, UCLA, 80 pages. Moore, L. C. (1995). Review of Language attitudes in Sub-Saharan Africa: a sociolinguistic overview. Issues in Applied Linguistics, 6(2), 153-154.